Associate Professor Katheryn Stowell (ONZM). A genetic research screening programme led by Associate Professor Kathryn Stowell is saving the lives of New Zealanders suffering from a rare genetic disorder malignant hyperthermia. The condition, known as MH, causes abnormal muscle contraction after exposure to anaesthesia, resulting in rigid muscles, a high temperature, unstable heart rhythm and, if untreated, can result in death. At present it affects around 50 New Zealand families, but the research led by Dr Stowell from Massey University’s Institute of Fundamental Sciences aims to provide an alternative anaesthetic against the rare, life-threatening condition. People suspected to suffer from MH are traditionally subjected to a biopsy procedure, which takes a large chunk of tissue from the thigh – leaving the person with permanent scarring. A much less invasive procedure is taking DNA samples and looking for mutations in the ryanodine receptor gene. The challenge Dr Stowell and her team face is that there are around 400 varieties of these mutations, with only 33 of those actually causing the disorder, and new ones being discovered every day. 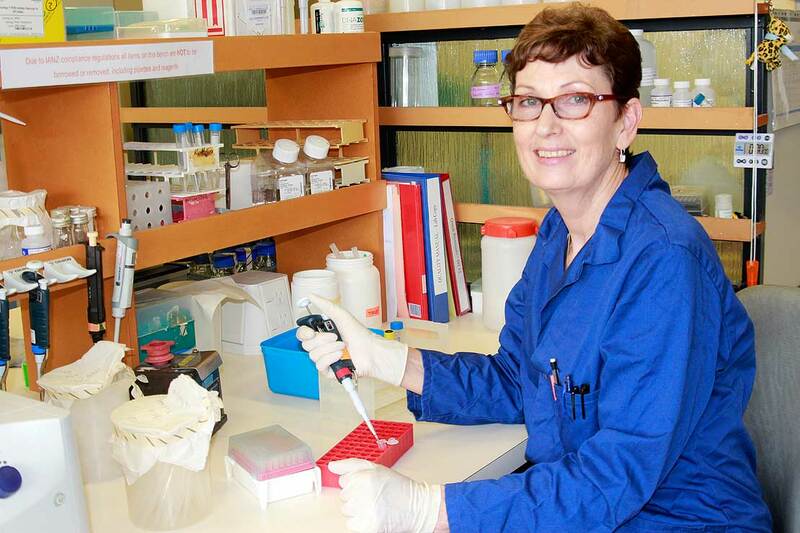 Dr Stowell and her team were the first to discover a novel variant of the gene back in 1995. Now, they are investigating four other genes to look for new variants as well as conducting functional analysis – a technique which allows them to bridge the gap between a person having a gene mutation and actually presenting with MH. Interestingly, the disorder can be traced back to a whaler who landed in New Zealand in the 1840’s and subsequently started a family in the Manawatū. Because of this, the incidence of susceptible MH patients is high in the Manawatu-Horowhenua region – fortunately where Dr Stowell is based. “This research is not only important for MH, but we’re learning what makes cells tick, and what can go wrong. So our work is also applicable to a wider range of disorders. The research features on an edition of TV3 currents affairs show 3D. Associate Professor Kathryn Stowell speaks to 3D reporter Paula Penfold. Click the image above to watch the full story.